One of the neanderthal genes that is dying out is the gene for red hair, the gene for red hair did not exist in the homo erectus or homo sapiens in Africa, it was a variant on the neanderthal gene. As the red hair gene gets absorbed it gets more diluted and in time will become even more rare. Wow, it almost looks like an erectus skull next to a homo sapiens. It looks more erectus then neanderthal even. 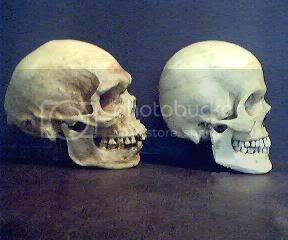 if you look up aborigine skulls, then yes, these are for real. I do not think race is a social construct. I think that geographically and physically we are different because of ancient admixtures. If one looks up reconstructions of homo erectus fossils from Asia, like peking man, they look remarkably asian. If we had homo erectus genes to use for comparison, we might find that many south east asians have a higher percentage of homo erectus and likewise that many Europeans have a higher percentage of Neanderthal genes and possibly that east Asia and Siberia is higher in Denisovan genes. We have basically few known "cousins" and they are Neanderthals, Denisovans, and Homo Erectus. How much of the above do you think are mixed into Europeans, East Asians, Southeast Asians, South Asians (Indian), and Aboriginals. I suspect that we have few more cousins yet to be discovered that are mixed into the different races making us even more diverse. If East Asians are more mixed with Neanderthals, how come there are no red hair found in Asians? I thought it looks more Denisovan. That skull is a very famous Aborigine skull from the 19th century. Almost all casts of Aborigine skulls that are for sale today are of that skull. 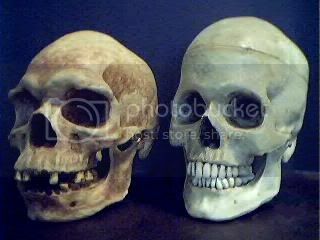 You can see that the whole skull is much different compared to a European skull. 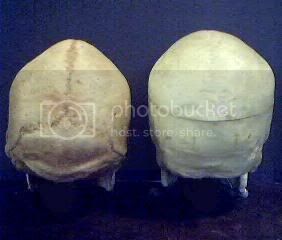 The height, width and length of the brain casing is shaped much more like a homo erectus than a European's skull is. Aborigines are known as exceptional trackers and they have been shown to have much better visual acuity than Europeans. This is due to their larger visual area of the brain, which is located at the back of the head. 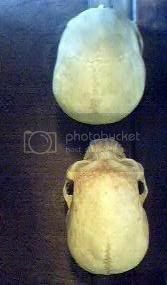 You can see that the Aborigine skull has a pronounced occipital bun at the back of the skull and they also have larger optical orbits. I think this is a very good picture of what happened, except there is missing links differentiating the East Asians and Europeans. These two ethnicities must have mixed with some other different group(s).